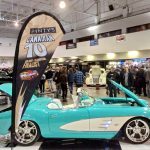 An exciting new feature of the fifth annual Motorama Custom Car & Motorsports Expo is the Zehr Insurance Mayhem in the Backroom, a celebration of traditional custom cars and hot rods, and the rockabilly lifestyle. 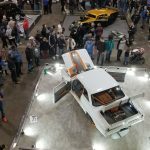 Mayhem will fill the 30,000 square-foot Hall 3 at Toronto’s International Centre during the show, which takes place March 8, 9 & 10 at the massive venue across from Pearson Airport. On Saturday (March 9), the Zehr Stage will come to life with the sounds of three incredible rockabilly bands. 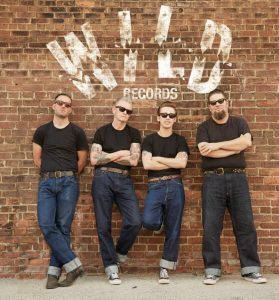 Headlining the show will be WILD Records’ Los Angeles-based Rhythm Shakers; the most ‘in-demand’ band on the international rockabilly scene. 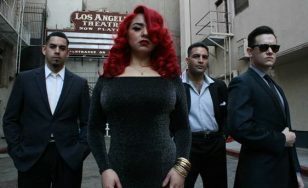 Known for the ferocity of their live shows, lead singer Marlene Perez is manic fireball who scorches the stage with backing from the tightest rhythm section in rockabilly. Perez’ wild red hair makes audiences believe that a call to the fire marshal is imminent. Their songs of heartbreak and hedonism are sung with alternating soul and savagery. Making only a handful of live appearances each year, The Rhythm Shakers (above) have headlined many gigs and festivals around the world, including Viva Las Vegas and England’s Rockabilly Rave. Their Motorama appearance will mark their Canadian debut, making their performance a ‘must see’ event. The Rhythm Shakers are a ‘day one’ member of the WILD Records stable, producing three CDs and several 45s for the label known as ‘home’ to the world’s most unhinged rock ‘n’ roll bands. Appearing on the Zehr Stage immediately prior to The Rhythm Shakers are Toronto’s own Greasemarks (right), the only Canadian band reckless enough – on and off the stage – to be part of the WILD Records family. Tasked with making sure Mayhem’s Saturday night party is suitably loose before the Shakers take over, these guys and their primal rock ‘n’ roll are no strangers to all-night house rockin’. Word of mouth for their live shows has taken them from Toronto backyard parties to the biggest festivals and car shows in North America. 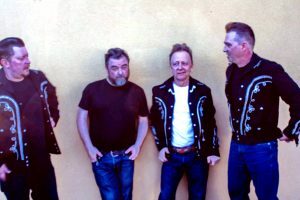 The Greasemarks’ debut CD was released at the Nashville Palace during 2018’s Nashville Boogie and was an immediate hit, getting constant airplay all around the Rockabilly world. Starting things off on Saturday (March 9) is another great Toronto band, The Royal Crowns (below). Known as Canada’s purveyors of greasy rock ’n’ roll since 1990, these regal rockers feature Danny Bartley on lead guitar, Teddy Fury on drums, Cory Richardson on upright and electric base and James Henry on rhythm guitar. Putting the swing, the swagger and the ‘billy’ back into roots music, their sound ranges from Rockabilly, to rhythm and blues, to surf, to hillbilly jazz. These gritty rock ’n’ rollers will get the dance floor jumping’ and the hearts a pumpin’. Saturday’s rockabilly show on the Zehr Stage gets underway at 4 p.m., with The Royal Crowns, following the conclusion of the Miss Motorama Pinup Pageant. 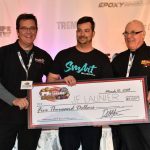 The Greasemarks will take over at 5:30 p.m., leading into the headline Rhythm Shakers at 7 p.m.
For tickets and show info, visit www.MotoramaShow.com. 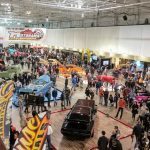 Motorama is Canada’s biggest indoor automotive enthusiast and motorsports expo.